Looking for a break from the usual sun, sand, and sea? Hike to the mystical rock in the clouds, Roque Nublo. 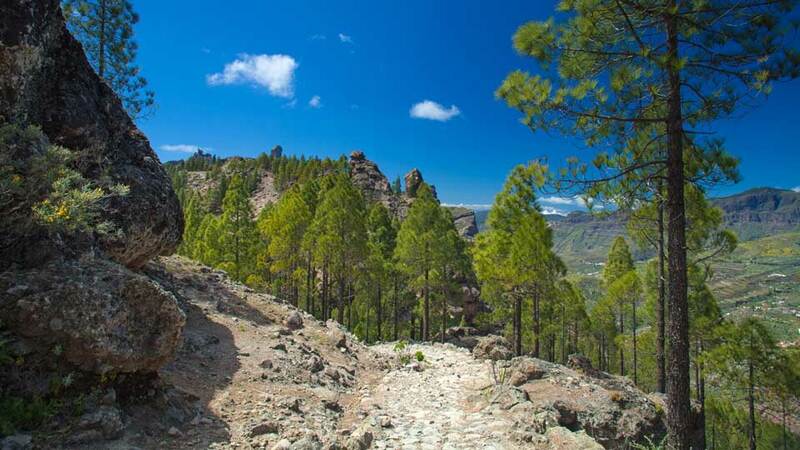 Found at the center of Gran Canaria in the Canary Islands, the second highest peak on the island is the perfect place to see the world differently in Spain. Roque Nublo or Cloud Rock is named aptly due to its cloudy or misty view. On most days, it plays hide-and-seek through layers and layers of thick cottony, white clouds. On other days, it’s blanketed by a thin cool fog, making it hardly visible to hikers until it greets them upfront. But on ideal days, it stands tall against a backdrop of clear blue skies, a truly majestic sight to behold. 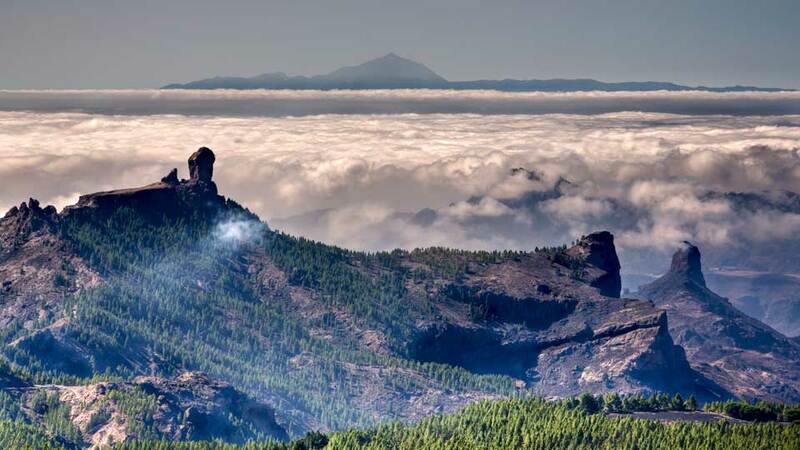 The same volcanic eruptions that created the island of Gran Canaria over 4 million years ago shaped Roque Nublo. Towering at about 80 meters high, and set elevated in the heart of the municipality of Tejeda, this famous rock formation seems to send out an invitation to people from all around. Standing proudly at 1,813 meters above sea level, travelers are rewarded with a fantastic 360-degree view of the whole island. Sometimes even the Teide Volcano from the neighboring island of Tenerife makes a special appearance, congratulating hikers. Together with the smaller Roque Rana on its southwest, the two pillars are like brothers looking down and guarding the caldera from the edge of the plateau. Both are part of the larger Parque Rural de Nublo, declared a UNESCO Biosphere Reserve. 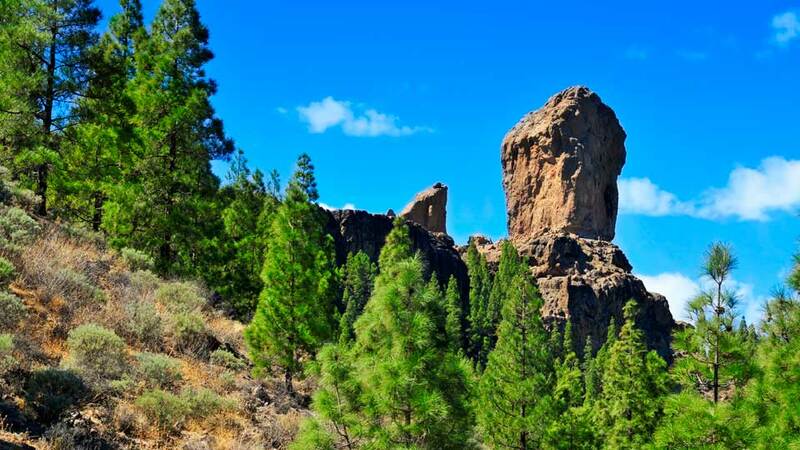 To modern inhabitants, the basaltic rock has become the main landmark in Gran Canaria. And to the original dwellers of the place, the aboriginal Guanches, this was a holy place. It’s a tiny bit of heaven where they used to offer sacrifices to the gods. Just like Aladdin and Princess Jasmin, expect “unbelievable skies” and “indescribable feelings” upon visiting the famous volcanic rock. The good news is, no one needs a magic carpet to get there. It is easy to get to Roque Nublo, thanks to its popularity as a central landmark and to the clear road signs all around. The main goal is to get to La Goleta, the parking at the base of Roque Nublo where the most popular hiking trail starts. If taking a bus from Las Palmas, the island’s capital, start at San Telmo and ride Line 303 headed to San Mateo. Then, transfer to Line 305 to Tejeda. Once there, Line 18 bus will get passengers to Ayacata, where La Goleta is located. 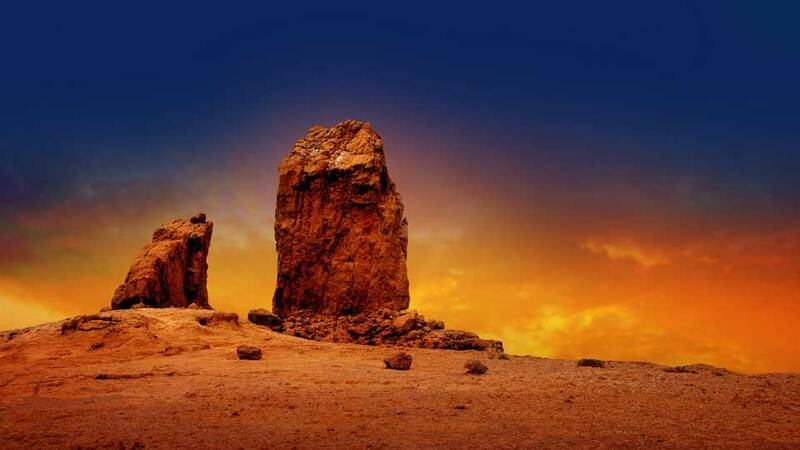 If coming from Maspalomas, just get on a Line 18 bus and tell the driver that the destination is Roque Nublo. For those who want to drive, the GC60 road is the easiest way to the place through Fataga and San Bartolome de Tirajana. The route to La Goleta parking lot is well posted with signs so no one will miss it. Be extra careful though, especially when it rains, as the roads may be steep and narrow at some point. But no matter the weather, the views along the way will always be postcard-worthy, so might as well enjoy the drive. From La Goleta parking lot, start the short uphill walk of about 1.5 kilometers to reach the mystic rock. The length of time varies for different people, but it could last from 25 minutes to an hour. The path runs through the edge of Tejeda’s cauldron or the Caldera de Tejeda. Moving uphill, the pine-scented forest sends a welcoming invitation to the nostrils. On mornings when the sun is generous, warm rays peek through the tree branches in the mountains before it hits the rocky ground. Not too far off the path, tourists get breathtaking views of neighboring viewpoints like Roque Bentayga, dams like Las Ninas, and the mountain side with the towns of Acusa and Artenara. But the scenery looks more magical when an icy fog leads and follows the trail. Once on the platform high up, and the haze is still there, take a good photo. The cratered surfaces and lava formations are partially hidden by a cool mist make up for a unique background. Social media friends would think it’s a snapshot of a Mars landing, sans a spacesuit. Once at the top, the central location of Roque Nublo Gran Canaria allows travelers a front-row seat to the spectacular scenery of the island below. Get a glimpse of the arid south as well as the emerald north with patches of lovely villages scattered across the mountains. When the clouds decide to take a break, Mount Teide, Spain’s highest mountain located in Tenerife island shows itself. But what’s most impressive is that the huge free-standing volcanic rock sits on the edge and is often hugged by passing clouds. Some tourists have tried climbing it, while others have tried going around it. For locals, going around it will bring good luck. Whatever guests decide to do, it is guaranteed to make their trip to the Canaries extra special. Since the wind could be chilly at times, a windbreaker or a jacket would prove to be handy. The last 100 meters of the path are the most difficult, so a pair of hiking or rubber shoes would be convenient. Try to get to the parking lot before 10 am to avoid the crowd. There’s limited parking space so securing a spot early is a good idea. Bring lots of water for the hike as there would be no access to snack bars or refreshments on the trail. Alternatively, travelers could follow the well-signed trail from the mountain villages. Stop by some quaint little restaurant. Enjoy a hearty meal, or indulge in a warm cup of coffee while taking in the stunning scenery. Visit the place twice, once in the morning and once at night. Why? Because during the day visitors could bask in the beauty of the landscape. But at night, high up in the plateau, the wide expanse of the pitch-black sky adorned by a million twinkling stars promises an utterly unforgettable and surreal experience. Gran Canaria boasts of world-class beaches at its coasts. But this round island offers more than that. Inland, it is also packed with beautiful geologic formations and interesting landmarks, like Roque Nublo. The gigantic monolith stands like a sentry at the center of the third largest island of the Canaries. Travelers experience a nature hike like no other and feel invincible at the top. In this rock in the clouds, tourists could get a break from the usual beach scene as their eyes feast on the wonders of nature’s grandiose. Here, the landscape tells a story in the morning, and the stars sing a silent lullaby at night.